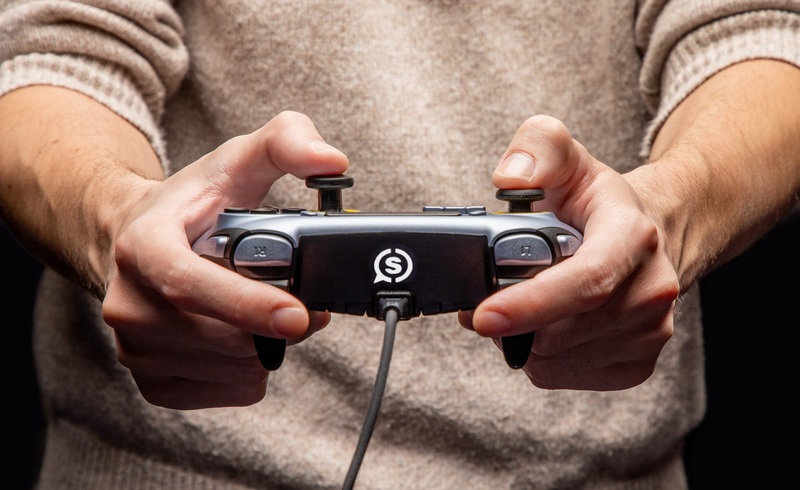 Scuf has been a long-standing name in the competitive console gaming scene since 2010, mostly taking players’ DualShock or Xbox controllers and modifying them with paddles and other essential upgrades. It wasn’t until 2017 that the first Scuf-branded controllers hit the market for the PlayStation 4: the Scuf Impact and Scuf Infinity 4PS PRO. Using the additional features of its predecessors as a foundation for innovation, Scuf’s latest controller brings more than just a pretty face(plate) to the competition: the Scuf Vantage is here and it wants to play for keeps. 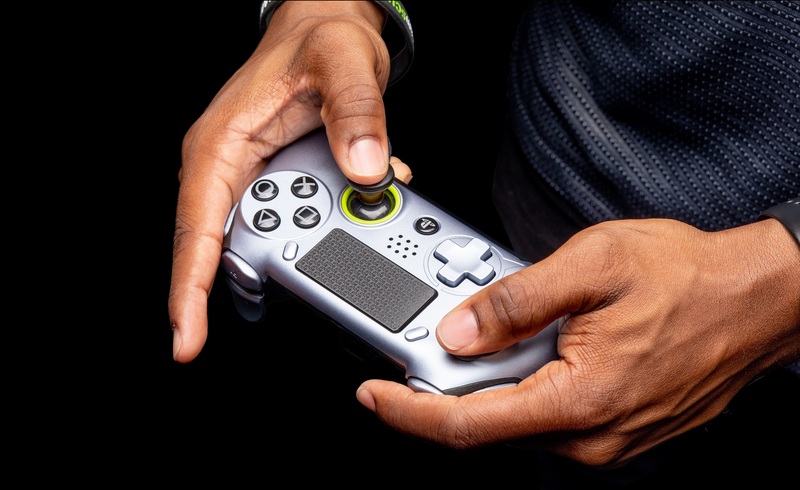 Every feature that you could possibly need on the Scuf Vantage is little more than a finger stretch away and you won’t even need to worry about taking your fingers off the trigger to do so. In addition to the standard buttons you’ll find adorning any DualShock 4, six additional buttons are easily within reach. SAX (Side Action) Buttons adjacent to either shoulder button can easily be pressed by the insides of your forefingers and a full array of four back paddles can make drop-shotting or reloading mid-sprint a breeze. If you keep accidentally hitting buttons that you won’t ever use, each one can be easily removed and stored in the included carrying case. Given how I hold my Vantage, I found myself taking off the extra shoulder buttons and only using two of the four paddles for reloading and crouching respectively. The components that are most important to FPS players, namely the triggers and sticks, can be customized to each players’ liking. Included with the Scuf Vantage are a pair of longer thumbsticks and triggers that I could myself fond of over what came stock on the controller and I could switch the full set out in about fifteen seconds flat with how quick and painless it was to upgrade the Scuf Vantage. If you are prone to switching roles from Sniper to Assault and need the shorter stick height, being able to modify your stick situation faster than popping off a set of KontrolFreeks can be the perfect change in between respawns. Reprogramming the buttons on the fly is an insanely simple task on the Scuf Vantage. Near the headphone jack at the bottom are toggles between wired/Wireless mode (if you’re playing on the Wireless model) and a flip switch that allows button reprogramming. Simply hold down the button you want to customize and press the corresponding button simultaneously and you’re done. Not having to connect to a PC to program it remotely is an underrated feature that more players should take advantage of just to keep their thumbs on the sticks at all times. Initially, I was worried about the sturdiness of the Scuf Vantage controller when I found out that most of the features are held on magnetically. The D-Pad can easily pop off when you want it to just by lifting up from the bottom of the down arrow, but not once during routine play through Castlevania or shuffling through menus did it pop off accidentally. The same could be said for the removable faceplate that comes right off when you lift up on the inner edges (strangely, the analog sticks have a tendency to get stuck in the position when the faceplate is removed, so I wouldn’t recommend taking it off just to shave a few grams of weight). Even the replaceable analog sticks can be removed with just a gentle tug but even rolling the edges and pushing the sticks to their limit gave me no shortage of resistance. 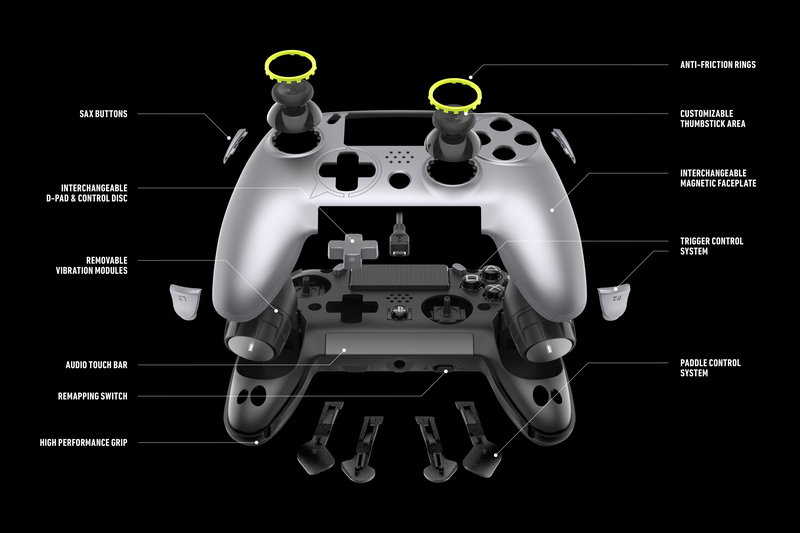 Many of the components on the Scuf Vantage controller, namely the triggers and extra paddles, have a very plastic feel to them that I was worried about snapping off in the heat of battle. Thankfully, the build quality on the Scuf Vantage far exceeds my expectation of a third party controller. Unless you’re prone to throwing your $200 controllers at a wall and having to pick up the pieces afterward, the Vantage should be able to handle most tasks under pressure. If there was one particular piece I’d be concerned with being cautious about, it would be the extended two-finger triggers for L2/R2; these pieces snap into place, so a bit of forced leverage might be enough to pop a trigger off and ruin your killstreak. If you’re running the Scuf Vantage through its Wired Mode (and unless you’re more worried about convenience and less about response time, there’s little reason to go with the Wireless Mode), the audio input feature gets activated through the 3.5mm headphone jack found in the usual location. A simple touchbar controls the volume in quick swipes while holding it down for a couple seconds will mute/unmute your mic. Embedded within the touchbar are a blue and red pair of LEDs that give you a quick indication of audio status and if your mic is currently hot. I only wish there was a way to lock that input because far too often, I’d bump the touchbar when I’m not paying attention and mute my mic and not even realize it until I looked down and saw that red light shining back at me. For a company that built its legacy on customizing existing controllers for tournament play, Scuf has done a fine job creating their own product that can easily compete. While some components in the box, namely the extended triggers and SAX buttons, have a plastic feel that doesn’t match the quality of the rest of what’s in your hands, each component works together to create a tool that’s definitely going to be seeing a lot of play in future tournaments. If you’re serious about leveling up your game and putting all of your fingers to work earning a Victory Royale, the Scuf Vantage is a serious contender for being the #1 tool in your PS4 arsenal. Review unit provided by the manufacturer. You can purchase the controller from GameStop. When you’re paying a premium for a PlayStation 4 controller, you want an advantage that you can’t get from a standard controller. The SCUF Vantage does exactly that, giving players ease in both accessibility and customization that goes far above and beyond what a Dual Shock 4 can do on the battlefield.